When I was a kid, we had a tradition of departing for family trips by car very early in the morning, around 4 or 5 a.m. Though I'm not quite sure of the reasons behind this, I have pleasant memories of this tradition—of sitting in the back seat half-asleep watching the sun rise as we embarked on a trip cross-state or cross-country, with my parents in the front seat. The last couple of years, I've done the same for my trips to San Diego. Of course, I have more practical reasons for adopting this practice: living in L.A., I know how bad the traffic can be on the 405 Freeway corridor between these two major cities, especially during rush hour in the middle of the week. So I try to get an early start, and often end up in San Diego around 6 am. It's actually fun to be at the convention center so early. It's surprising how much work still needs to be done before the show opens for preview night, so there are forklifts all over the place, the carpeting is still being put down, drapes on tables, and people are putting together their booths. I'm usually done by lunch, so I walk around, take in the atmosphere, see friends, then check in to my hotel to wind down before the show begins. Based on my experience, over the years, I've developed check lists to remind me of things I need to bring down for the show and when I need for vacation. I'm happy to post them for download (click on the file to download): my Convention Checklist (for exhibiting) and my general Travel Checklist. Below is my contribution to the souvenir program for this year's Comic-Con International in San Diego. Click here to see it in fuller detail. 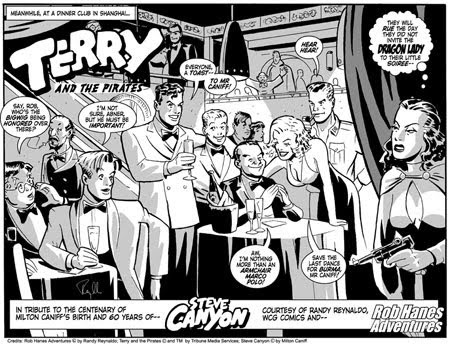 Caniff is pictured seated at the table, and surrounding him from Terry and the Pirates are Pat Ryan, Terry Lee, and Burma from Terry and the Pirates; Steve Canyon (from his namesake strip); pining away in the foreground at far right is the iconic Dragon Lady. I also usually try to somehow work my own characters into the theme. So at bottom left, you'll see my character, Rob Hanes, and his partner, Abner McKenna, commenting on the proceedings. 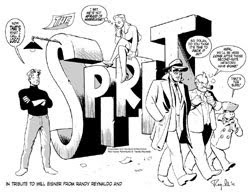 Also included in the drawing are various Caniff characters, all from Terry: Captain Judas (visible behind Rob and Abner); Anthony Sandhurst and his put-upon wife, Normandie Drake (Sandhurst is the direct inspiration for my own character, Antony Cromwell); Chopstick Charlie, Raven Sherman and Dude Hennick (the first two are partially obscured by the Terry logo); and at the rear of the club on the balcony are Terry's companions, Connie and Big Stoop. I should note that I also thought about contributing a drawing celebrating the centenary of the birth of Herge, the Belgian creator of Tintin. My plan was to draw my character putting gel in his hair to emulate Tintin's famous spiked forelock, just as Tintin walks in on him. But I just didn't have the time to complete the drawing. 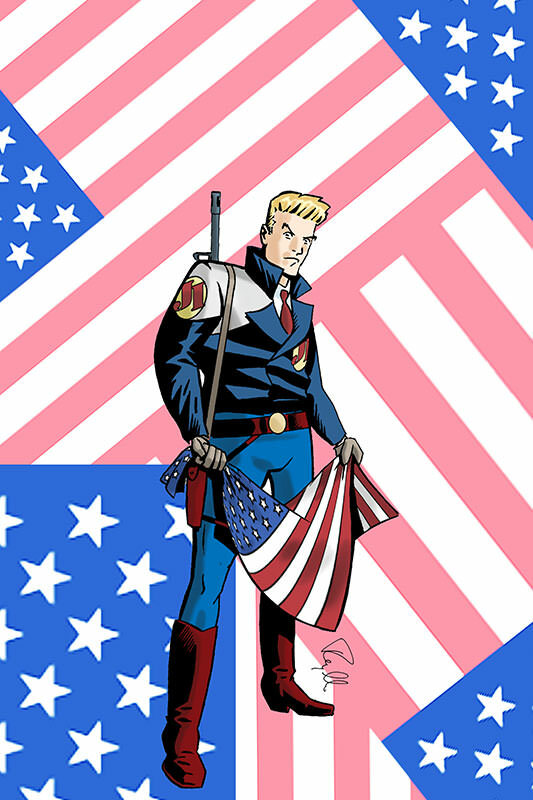 (At right is a personal favorite Comic-Con drawing from 2005, honoring Will Eisner, which you can see full size here).